One of our favourite mobile games recently has been Jet Car Stunts and so when we heard it was to make its way to our beloved Xbox we sat up and took note. We also decided it would be a great time to try and get a quick Q&A interview with one of the team from Grip Games and co-founder Jakub Mikyska seemed like a great starting point. Please introduce yourself. What is your role at Grip Games? Hey. My name is Jakub and together with my colleague Jan, we are the co-founders of Grip Games. As is the case with many indie game developers, I have about fifteen different roles in the project 😉 But I am mostly responsible for business and marketing stuff, and a little game designing, a little project management, a little QA and I am also the guy who does the swearing when things don’t work as they should. 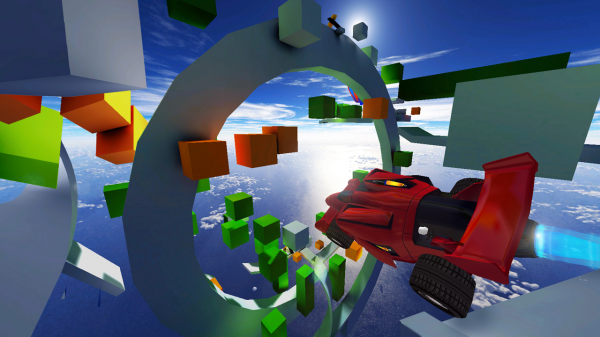 So, sell it to us…….Why should Xbox gamers buy Jet Car Stunts? The first thing that comes to my mind is “because it’s incredible”. Now, don’t take just my word for it, the original Jet Car Stunts is one of the highest-rated racing games of all time, currently sitting at 94 at Metacritic. 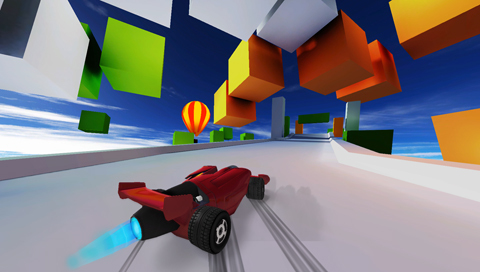 It is a hybrid between a racing game and a platformer, with a jet-powered formula car. 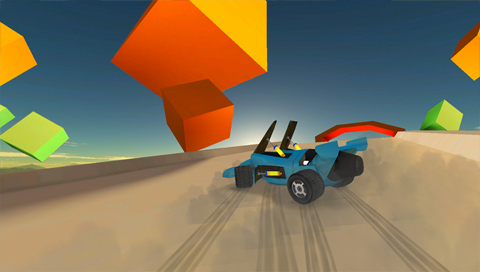 The best thing about Jet Car Stunts is how addictive it is, thanks to its track design. Most people feel this irresistible need to come back and improve their best times again and again. Another good reason why you should be excited if you already played the game on tablets before is because this is not a port. This is actually a new entry in the Jet Car Stunts franchise, sort of “remake” of the original in a new engine. This means that the graphics has been improved; there are new cars, new game modes, and the asynchronous multiplayer. Even if you played the mobile game, there’s a ton of new stuff. For those who haven’t played the mobile game, should they expect a 4 wheeled ‘Trials’ game? I think that anyone who enjoyed Trials will also enjoy Jet Car Stunts, but the games are very different. The biggest difference is the flying aspect of JCS. You’re basically sitting in a jet plane with wheels. There are many sections where you have to fly, rather than drive, and control your car like an airplane. The jet is also very important – you have only a limited amount of jet fuel between checkpoints and using it right is very thrilling. You may use it to push your car to maximum speed while you are driving a long straight road, but then you might miss it when you are required to make a mile-long jump. Are we going to be seeing the same game as the mobile version or have you made any big amendments to bring it to the 360? “If it ain’t broke, don’t fix it” is our main motto here. It’s essentially the same game and everything that was great about it is here. But as I wrote, it’s a remake. The most notable difference is the graphics. It is looking like a proper console game and if we manage to get Jet Car Stunts to Xbox One (fingers crossed), it is going to look even better. 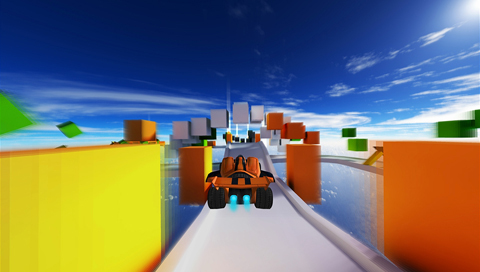 We have changed some of the tracks, we have added more cars, some of the which have quite different characteristics, improved physics, we have added a new game mode, called “Puzzle”, where you have to figure a way how to get to some of the most unreachable spots and we have added asynchronous multiplayer that lets you race against your friends and the best racers overall. We have also changed the controls to support gamepad and to be more responsive and let’s frustrating that the mobile version. So, I would say, we kept all the good stuff in it, but made sure that it is relevant Xbox game. Not just a port. How long has the development process taken? Were there any large hurdles to jump over along the way? At this point, we are working on Jet Car Stunts for almost a year. It’s great to finally see the light at the end of the tunnel. One of the hurdles we had to solve was the dilemma between keeping the old and adding new things, especially with the graphics. 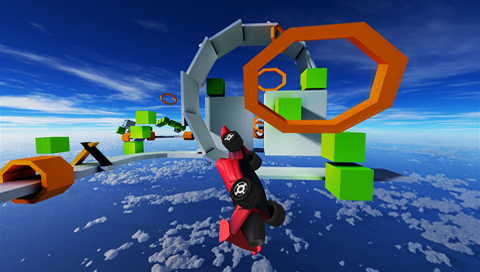 Jet Car Stunts has such a unique visual style and we had to find a balance between making sure it looks great on huge TVs, but also keeping it faithful to the original. Since we support several consoles and also PC and we plan nearly simultaneous release across all the platforms, that is quite an achievement for an indie developer as well, I think. I am really proud of the way we managed to translate the controls to the gamepad. The tilt-controls of the mobile version was its biggest weakness, but also allowed for precision and building of skill. We have transferred this system to gamepad, making the controls significantly less frustrating, while still keeping the skill aspect in it. Jet Car Stunts looks to be a pretty tough nut to crack. Should we be worried for our sanity? How difficult is the game going to be for the average gamer? I wouldn’t say it’s that difficult. The first trailer shows mostly the crashes, but the game isn’t as difficult as let’s say Trials. It just requires precision and some learning. But in the end, the experience is more about the adrenaline and racing at the edge of control, never sure whether you are going to make it or not, rather than frustration. And with that in mind, how many hours of gameplay can we expect Jet Car Stunts to give us? To complete all of the tracks, an average gamer will take about ten hours. But Jet Car Stunts is all about going back, improving your times, getting Gold medals, beating the competition. If you are competitive or obsessive perfectionist, you can easily sink 50 hours in JCS. Will there be any Kinect features included? Is something like voice activated boost a possibility? At the moment we don’t have any Kinect functionality. We don’t want to make it a gimmick, but rather something that adds to the game and something that counts with Kinect from the very beginning. It is possible we may add something before the game is finished, but I cannot guarantee it. How about DLC? Are we likely to see any for Jet Car Stunts, perhaps to add to the 36 included tracks? Was it tempting to enhance the graphics and make them more detailed on the Xbox 360 version? We looked at other racing games for consoles as well as PC and we knew we had to be on the same level. The original graphics works for mobile devices and small screen, but does not work for TVs. Our cars have significantly more polygons and details, the same can be said about the tracks. The lighting has been redone; there are post-processing effects like bloom and motion blur that weren’t present before, UI and menus are completely different… It’s also worth noting that the game runs on 1080p and the Xbox One version will run at 1080p / 60 fps. We want to make sure that nobody considers Jet Car Stunts a mobile port. It is a new entry in the series and if you didn’t know the game originated on tablets, you couldn’t guess that from looking the game. You mention you hope to get Jet Car Stunts onto Xbox One. What are the chances of this becoming reality? Would an Xbox One release happen around the same time as the 360 version? I would say the chances are pretty good. The release wouldn’t be the same day as the 360 version, but soon after that. Simultaneously with the PS4 version. And finally, achievements are still a massive part of any Xbox gamers life and the best achievements bring new dimensions to a game. Will there be any super cool cheevos we can work towards? Many thanks go out to Jakub for agreeing to this quick Q&A. Jet Car Stunts has been a favourite of ours on mobile and we’re pretty sure that we’ll have the same feelings once it makes its way to Xbox 360 in May and then hopefully Xbox One. You can check out more details of the game by visiting the official Grip Games site, by following them on Twitter or by watching the announcement trailer below. Next articleWant to experience E3 2014 live with Ubisoft?